Referred to as the “front door” for accessing Early Intervention services for children from birth to age three with developmental delays, our Child and Family Connections is one of 25 locations throughout the state of Illinois. Designated as CFC #6, Clearbrook provides case management and access to therapeutic services to children that reside in north and northwest suburban Cook County. In order to qualify for Early Intervention services, a child must have at least a 30% developmental delay or a qualifying medical condition. Once an evaluation of the child has been performed, an Individual Family Service Plan (IFSP) will be developed with the family. This IFSP will spell out the services the child will receive. Some of the services covered include: speech, language, occupational, physical and developmental therapies; social work; psychological services; assistive technology; nutrition and nursing. Early Intervention philosophy follows the developmental model, rather than the medical model, and stresses the importance of family participation and the family’s relationship to help the child grow and develop. Therapists work with caregivers so that they are able to help the child gain skills. For this reason, services are generally provided in the child’s natural environment, home or child care setting. What is the mission of Early Intervention? To identify all children from birth to age three who are exhibiting delays or are at risk of developing delays in the emergence of developmental skills. To ensure that all eligible children and their families receive appropriate support to optimize functional skills and enhance social competence. How does a child become eligible for Early Intervention services? Children must be experiencing developmental delays in one or more of the following areas: cognitive, physical, (including vision and hearing), language, speech and psycho-social development and/or self-help skills. Children may also be eligible due to diagnosed physical or mental conditions (such as cerebral palsy or Down syndrome) or certain family circumstances that put them at risk of having substantial delays. What is a natural environment? This refers to family-centered settings in which a therapist provides services to a child. Why is it important for the child’s caregiver to participate in the therapy sessions? Early Intervention is designed to help families help their children grow and develop through their daily routines. Parents and other caregivers have the opportunity to interact with their children throughout their day, so they can be given strategies by their therapists to use to help their children make developmental gains. Who pays for Early Intervention services? 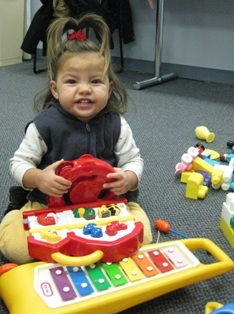 Early Intervention services are paid for with a combination of government and family resources. The cost of some services are paid by the program and provided to families at no cost. These include evaluation, assessment, development of a service plan, and service coordination. Ongoing Early Intervention services are paid for by the family’s health insurance, when appropriate, government insurance (All Kids), and program funds. Families contribute to the cost of services by paying fees based on a sliding scale. Director – Manages the entire program. Assistant Director – Supervises Service Coordinators, plus has a small caseload of families. Service Coordinator – Also referred to as a case manager, coordinates services on behalf of the child and family. Social Emotional Specialist – Provides support to staff and families regarding emotional and mental health issues. Parent Liaison – Parent of a child with special needs who is available for family support and community resources. Local Interagency Council Coordinator – Coordinates a local council which identifies and coordinates resources and services available within our service area. Intake Coordinator – Takes referrals for Early Intervention services. Child and Family Connections serves young children from birth to age three. When a child turns three years of age, Clearbrook will assist with a referral to their local school districts. Jason Tietz, Program Director, at 847-385-5342 or jtietz@clearbrook.org for general inquiries. Melissa Pitts, Intake Coordinator at 847-385-5070 or mpitts@clearbrook.org for referrals. Sherry Mackey, Local Interagency Council Coordinator & Parent Liaison, 847-385-5069 or smackey@clearbrook.org for service provider inquiries.